Windows 10 will be launched in 2015 and I’m sure it’s going to be a big hit because of its user-friendly interface and additional features. Currently Windows 10 technical preview is available for testing purposes and you can Install it via USB on your PC if your PC meets Windows 10 requirements. Windows 10 technical preview is a beta version and betas always have bugs and problems in them. Although Microsoft is improving Windows 10 TP day by day by sending consistent updates, but there are still chances of errors in it. This technical preview is very much stable and I’m using it from the date of launch, currently my PC is running the latest build i.e. 9879 and it’s working just like an original copy. It’s stable and any home user can use this version of Windows 10 but I’m having some problems with its Wfi connectivity. I’ve three different Wifi connection at my workplace and two of them don’t connect to my laptop with ease and show this of error “can’t connect to the network”, I need to forget those Wifi networks and when I reconnect with those forgotten networks again, they connect successfully. 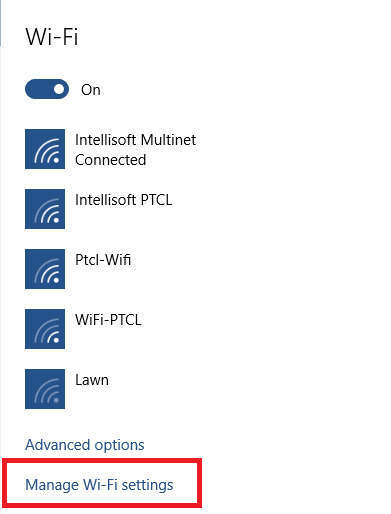 In Windows 8.1 it was easy to forget a saved network but Windows 10’s PC Settings and Wifi connectivity screens aren’t embedded in the taskbar; so it’s a bit difficult to find and forget the saved Wifi network. 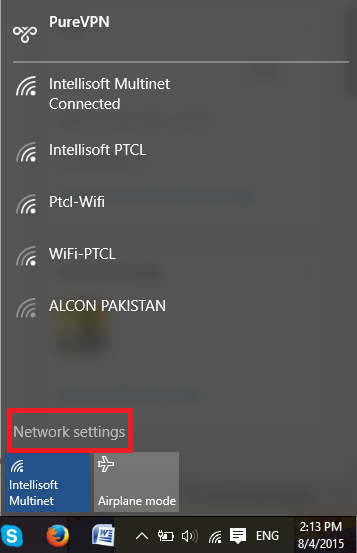 Step 3: In the “Network settings” window you’ll find the the option to manage wifi settings, click on it. 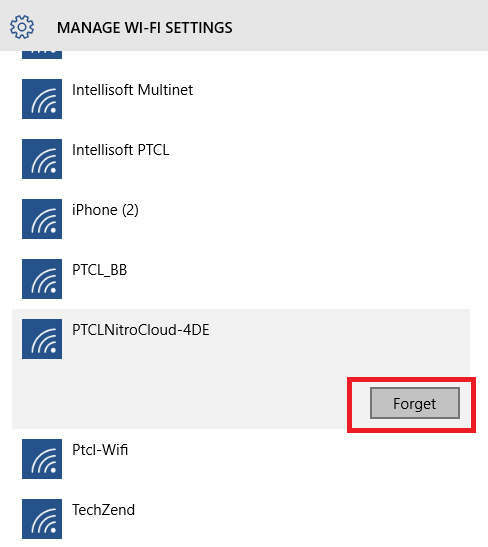 Step 5: To reconnect to that forgotten network, go back to “connections” tab and click on “Wifi” and save password for that forgotten network again. It’s a simple solution you can try in case of Wifi connectivity issues, but remember if you forget a network, its password will be removed and you’ve to enter the password again to connect with that network. If you’re using someone else’s Wifi and don’t know its password then do not forget the network, otherwise you’ll have to request that person for the password again. Thanks a lot ! Really helped me. Just installed windows 10. This is an extremely annoying change from windows 7 if you deal with networks that frequently change their passwords. I just spent an hour trying to figure out how to do this since it is no longer available via a simple right click. Way more work! Also hard to figure it out when you can’t get an internet connection to find the solution and Windows own search menu can’t even direct you to the Forget option. Your tutorial saved me a lot of time. Many thanks! Why did Windows 10 have to remove the simple right click > Forget option? As Anne said, it’s extremely annoying and inconvenient. If it’s not broken, don’t fix it! Microsoft, are you listening? Thank you so much! This was WAY harder to find than it should have been. Gee thanks to Microsoft for doing their best to hide power user settings!